Knowledge and commitment into action. In 2009, Her Majesty Queen Máxima of the Netherlands was designated the United Nations Secretary-General’s Special Advocate for Inclusive Finance for Development (UNSGSA). Since then, she has emerged as the leading global voice on the importance of inclusive finance in achieving job creation, equitable growth, poverty alleviation, health, food security and empowerment of women. In 2013, we were invited to help transform Her Majesty’s Annual Report to the Secretary-General from a number crunching report into a more useful advocacy tool that could promote the importance of financial inclusion in achieving social and economic development goals worldwide. Reporting on financial inclusion is no easy task. We needed to move from faceless statistics to concrete examples that would emphasize results and the global impact of UNSGSA, but also make sure that the findings could be easily distributed to all global partners. We also needed to make sure the report was distinctive enough to stand out amidst the hundreds of reports put out by the UN each year, while also adhering to the organization’s strict branding guidelines and international sensitivities. Knowledge is power—but data without context is not knowledge. 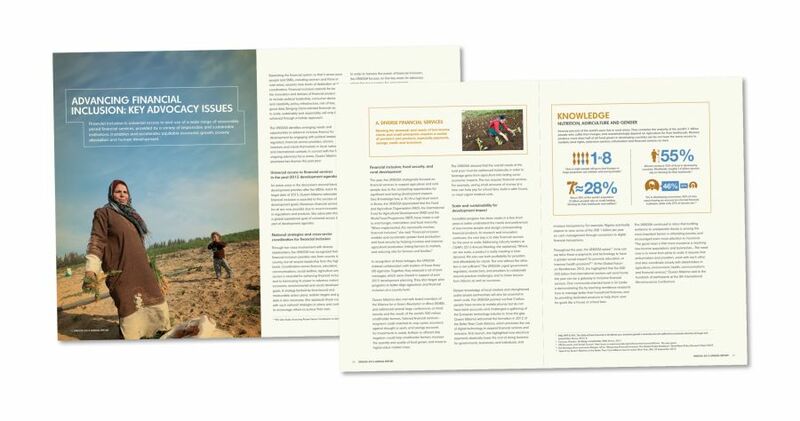 We transformed the important numbers buried in the text into more easily digestible pieces of information that could serve as advocacy tools beyond the report. Reviewing the original report brief, we found a sub-headline we liked so much that we decided to adopt it as an overarching theme—“Converting commitment and knowledge into action and implementation.” The statement had been embraced internally at the organization but had never before been used in external communications or an advocacy plan. 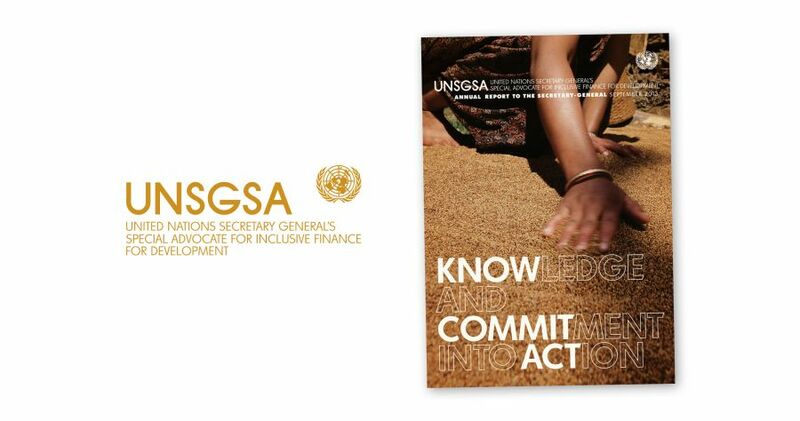 Following discussions with UNSGSA, we developed a simplified version— Knowledge and Commitment into Action—that helped unify the diverse data into a single, more powerful message. Knowledge and Commitment into Action prompted a revision of the entire report in terms of content and scope. New sections were added and previous ones were refocused on these three concepts. Data selection was also reevaluated in order to better communicate the new message. 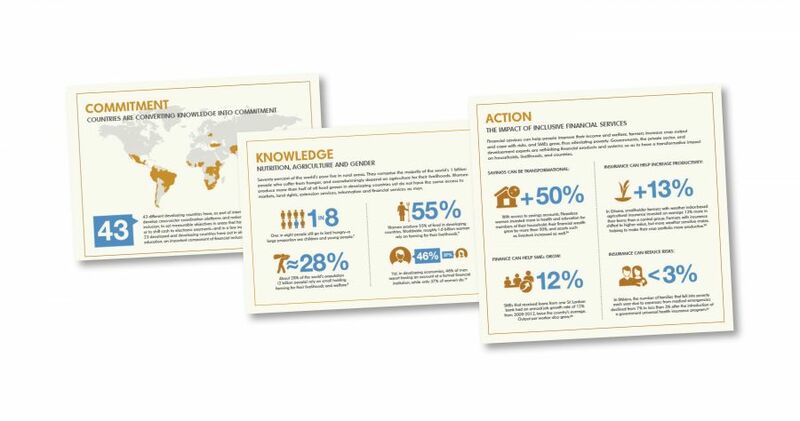 It provided the communications team with a system that not only helped them combine data and content into a cohesive message-driven report but also gave them a frame in which to base other communications materials, including speeches, briefs and presentations. An alternative version of the original line—Know, Commit, Act—became a clear call to action and the basis for infographic advocacy tools that were later added to their website and distributed among partners. All this from a sub-headline buried in a brief.